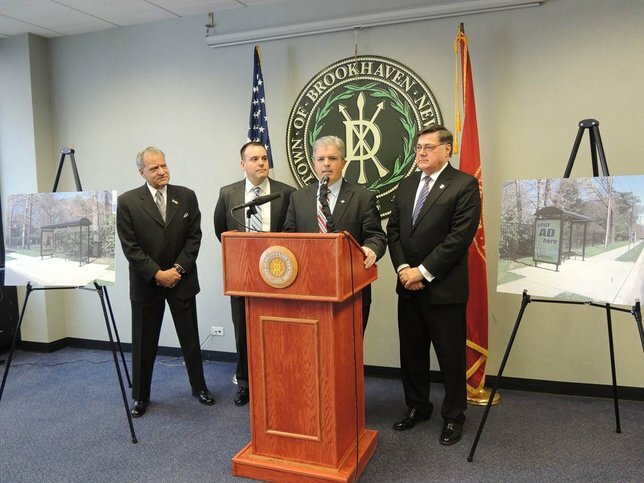 Brookhaven, NY - February 27, 2014 - On February 26, County Executive Bellone was joined by Brookhaven Supervisor Ed Romaine, Legislator Tom Muratore and Deputy Supervisor Dan Panico to announce yet another shared services agreement between Suffolk County and the Town of Brookhaven which will provide bus shelters on County roads within the Town of Brookhaven. Supervisor Ed Romaine offered to extend its advertiser supported bus shelter program to the county for the construction of bus shelters on County roads. This Intermunicipal Agreement was approved by the Suffolk County Public Works Committee on February 24, 2014 and will be before the full legislature for approval on March 4, 2014. This program will allow Signal Outdoor Advertising to construct bus shelters along county roads at no cost to the County or the Town. This initiative once again highlights an opportunity where the County and Town can share services and the residents of Suffolk County are the beneficiaries. This agreement represents the second opportunity where the County and the Town of Brookhaven have been able to enter into a shared services agreement. The first shared services agreement consisted of Suffolk County helping to facilitate access to counseling and assistance services for eligible veterans, their spouses, dependents and survivors. The agreement, which assigned one accredited Veterans Service Officer (“VSO”) from the County’s Veterans Service Agency to provide services at Town Hall or other designated Town facilities, has vastly improved services and saved taxpayer dollars. Subject: LongIsland.com - Your Name sent you Article details of "Bellone and Romaine Announce Advertiser Supported Bus Shelters on County Roads in the Town of Brookhaven"